We don't have an official number but I imagine the loss of life on both sides is astronomical. But, when I take a look at the panel where Kyou Kai and the HSU stand over all the grisly corpses, I can’t help but think that Zhao is probably in worse shape. More and more, I see Zhao leveraging the success of this war on a single object - provisions. 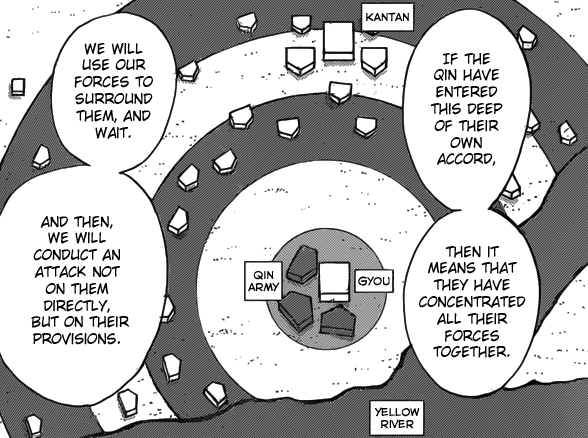 At first, I thought Shun Sui Ju just got lucky wiping out half of Heki’s food supply, however, according to chapter 516, this was all an orchestrated effort from the very beginning by Ri Boku to crush Qin’s invading army. I think, that somewhere in that genius mind of his, Ou Sen alone understands the complexity of this venture, possibly why he prepared for it as much as he could and why he hijacked all the food from Gyou’s neighboring cities. I feel Ou sen is 1 step ahead of Riboku right now. When Riboku read the message, we got a shot if his eye and he seemed a bit startled. I think he lied to him men about the numbers. He did this to bust the morale. We also got a closeup of Kin Mou's eye and he had esclamation marks next to him. I believe he thinks that the number Riboku stated is not correct. You’re right. In fact, the dude about to hand over the news to Ri Boku appears suspicious. He can’t even look him in the eye, like he's hiding something. My guess is Ri Boku suspects the info has been purposely distorted to mislead them and he’s just playing along for the moment.